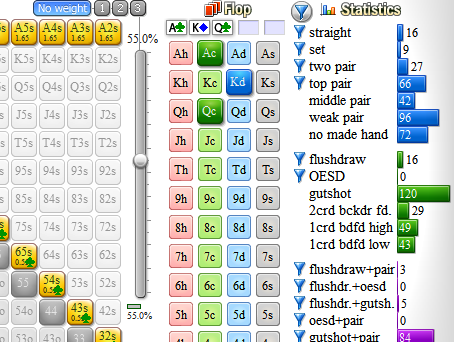 Flopzilla is a poker calculator that has been designed to let you quickly and easily figure out how a range hits a board. 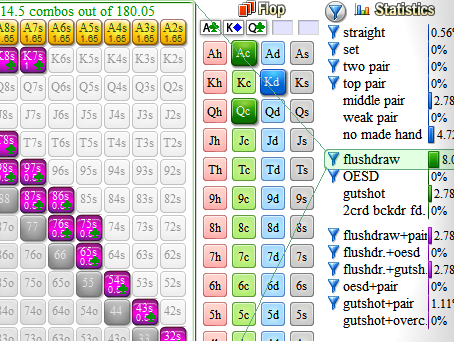 Just enter a preflop range and a board and Flopzilla will work out for you how often that range hits hands like top pair, middle pair, a flushdraw, a gutshot, etc. The interface is designed to be quick, easy to use and intuïtive. The calculations themselves are so fast that a "Compute" button is not even necessary. Just make any change and the results will instantly adjust. (Demonstration videos, written manual). If you're interested in combo research, press TAB to toggle to combo mode. The "Statistics" section will now display its output in combos. 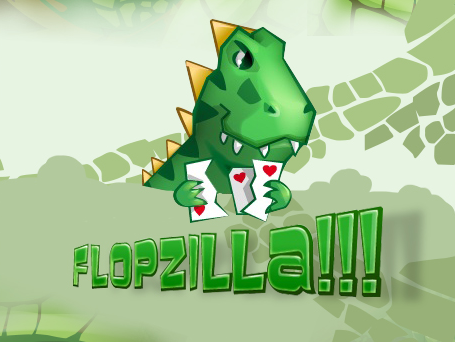 If you want to expand your research beyond the flop, Flopzilla offers an easy-to-use filter system to remove hands from the range. Just left-click a statistic to add a blue filter symbol to it. Turn the filters ON with the main "Filter" button (bottom right) and they will become active. Only starting hands that apply to a filter will be now used in the statistics. Hands that have been filtered out of the range will be grayed out in the starting hand matrix. Also, the starting hand matrix will show the number of combos that are left for each starting hand. To take a closer look at the contents of any statistic, mouse over it. Its contents will light up in purple. 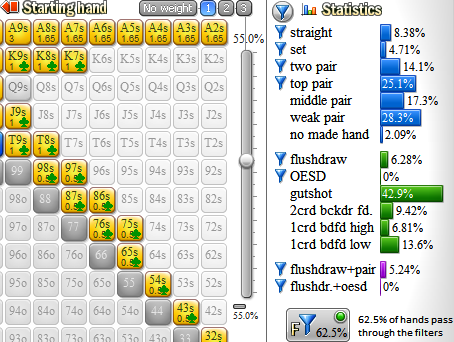 If you right-click the statistic, you will be able to apply custom filters to individual starting hands. A video manual by the author is available here. For the written manual, go here. 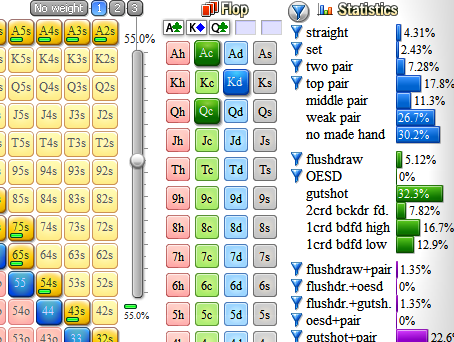 HoldEq is an equity calculator that comes free with Flopzilla. It has the ability to connect to Flopzilla and import whichever range is present in it. 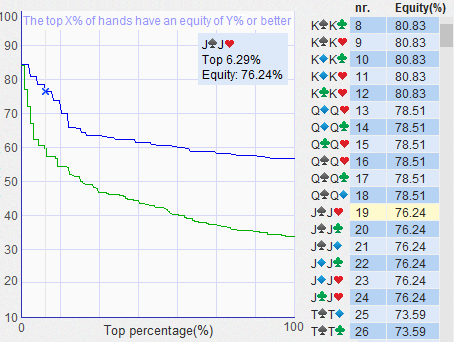 Another special feature is that it's capable of visualizing the equities of individual starting hands in both graphs and tables (see screenshot). Other than that, HoldEq can also be used as a stand-alone equity calculator. It is very fast and its range editor is capable of dealing with weights and suit selection.